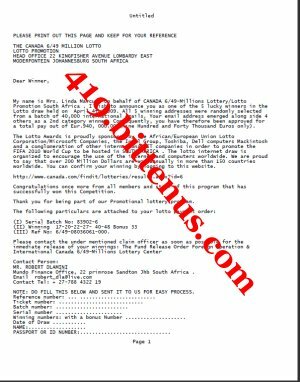 My name is Mrs. Linda Marcus, on behalf of CANADA 6/49-Millions Lottery/Lotto Promotion South Africa . I wish to announce you as one of the 5 lucky winners in the Lotto draw held onApril 4th 2009. All 5 winning addresses were randomly selected from a batch of 40,000 international emails. Your email address emerged along side 4 others as a 2nd category winner. Consequently, you have therefore been approved for a total pay out of Eur.940, 000.00 (Nine Hundred and Forty Thousand Euros only). The Lotto Awards is proudly sponsored by the African/European Union Lotto Corporation/Microsoft Companies, the Intel Group, Toshiba, Dell computers Mackintosh and a conglomeration of other international IT companies in order to promote the FIFA 2010 World Cup to be hosted in SOUTH AFRICA . The lotto internet draw is organized to encourage the use of the internet and computers worldwide. We are proud to say that over 200 Million Dollars are won annually in more than 150 countries worldwide. You can confirm your winning by logging to this website. Congratulations once more from all members and staff of this program that has successfully won this Competition. Mundo Finance Office, 22 primrose Sandton Jhb South Africa . NOTE: DO FILL THIS BELOW AND SENT IT TO US FOR EASY PROCESS.